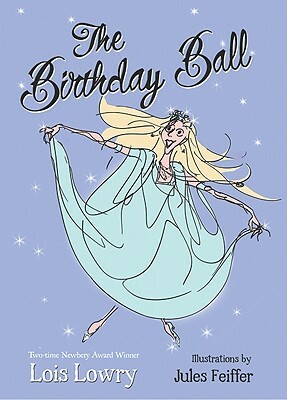 The Birthday Ball by Lois Lowry, illustrated by Jules Feiffer. (Grades 2-5.) Houghton Mifflin, April 2010. Reviewed from ARC provided by the publisher through NetGalley. Princess Patricia Priscilla is nearing her sixteenth birthday, a very special birthday in her kingdom. For when she turns sixteen, the Princess will have a special birthday ball at which she'll choose a suitor to be her husband. The problem? Well, first of all, all the available suitors are awful brutes and the Princess can't stand any of them. Not to mention the fact that the Princess thinks she might like to know what life is like outside the castle... So she orders the maid to trade clothes with her and heads off to the village school. It can't hurt, right? But it ends up changing everything! The Birthday Ball is a pleasant little ditty of a book. It's got a nice dose of humor that will meets its mark with elementary students. It's a little fairy tale with a spunky princess and a dash of potty humor. I'm not really sure what else to say about it. Kids will find it a pleasant diversion, but I don't think it'll change anyone's life, which is fine because not all books have to be life-changing. Sometimes it's enough to have a pleasant diversion. And kids looking for an afternoon escape will find what they need in The Birthday Ball. Read more reviews at Charlotte's Library, GreenBean TeenQueen, Book Aunt, and emilyreads (says it all). The Birthday Ball is on shelves now!